With porches and dormers both front and rear, this four bedroom, three bath home celebrates country life in an open floor plan with bonus room for family living. A second level balcony overlooks the spacious great room with cathedral ceiling and clerestory with arched window. A palladian window clerestory also bathes the two-level foyer in natural light. The privately located master suite features a generous walk-in closet, double lavs, separate shower, and whirlpool tub. 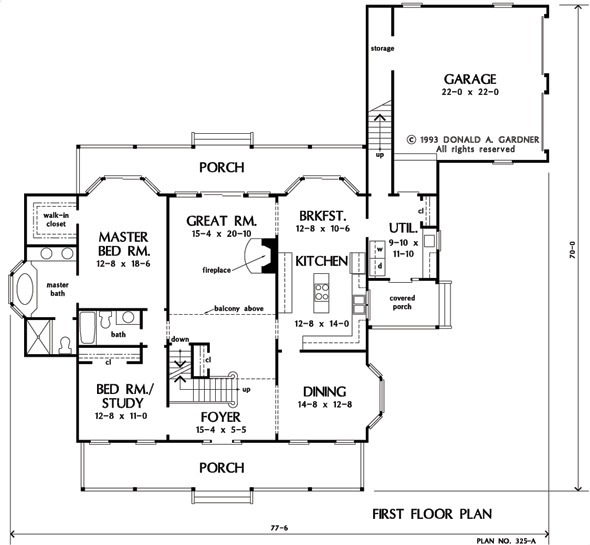 Master bedroom, breakfast area, and great room open to the back porch. 1st Floor: 1871 Sq. 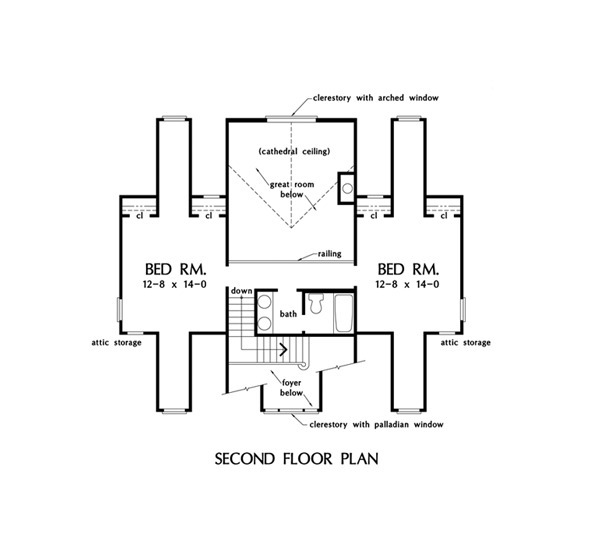 Ft.
2nd Floor: 731 Sq. Ft. 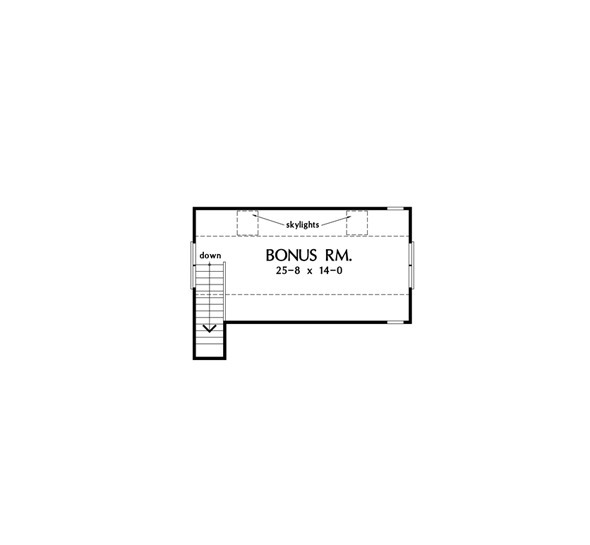 Bonus Room: 402 Sq. 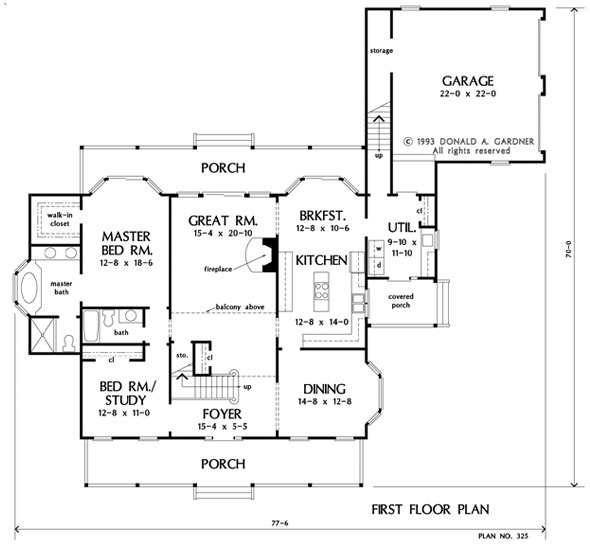 Ft.
House Dimensions: 77' 6" x 70' 0"
Great Room: 15' 4" x 21' 0"
Master Bedroom: 12' 8" x 18' 6"
Storage (1st Fl.) (Sloped): 3' 2" x 7' 10" x 0' 0"
Foyer (Vaulted): 15' 4" x 5' 5" x 20' 0"
Dining Room : 14' 8" x 12' 8" x 9' 0"
Great Room (Cathedral): 15' 4" x 21' 0" x 20' 0"
Kitchen : 12' 8" x 14' 0" x 9' 0"
Breakfast Room : 12' 8" x 10' 6" x 9' 0"
Utility Room : 9' 10" x 11' 10" x 9' 0"
Bonus Room (Vaulted): 25' 8" x 14' 0" x 8' 0"
Garage Storage : 3' 4" x 18' 1" x 0' 0"
Master Bedroom : 12' 8" x 18' 6" x 9' 0"
Bedroom / Study : 12' 8" x 11' 0" x 9' 0"
Bedroom #2 : 12' 8" x 14' 0" x 8' 0"
Bedroom #3 : 12' 8" x 14' 0" x 8' 0"
Porch - Front : 42' 0" x 7' 0" x 0' 0"
Porch - Rear : 41' 8" x 7' 0" x 0' 0"
Porch - Right : 10' 2" x 7' 0" x 0' 0"
Balcony : 15' 4" x 3' 5" x 8' 0"